Cook up a Layout A page makeover is a great chance to try out your new digi techniques and artsy skills. This week we’ve cooked up a little recipe for you to follow. Use it to spice up a page redo or substitute a summer related cooking page or a recipe page. Here are the key ingredients and the mix is as easy as 1, 2, 3. ...add any other ingredients you wish to spice up your page and suit to your taste. Upload your page to the Anna gallery (with Makeover in the title) and post it here in the forum so we can all admire your new style. If you do a makeover try to include the 'before' page. See instructions here for how to do this. But don't worry…you can skip this step if you want to. One lucky participant will be randomly selected to win a $5 GiftKard to Anna’s shop. The winner will be posted here on Monday, July 2. 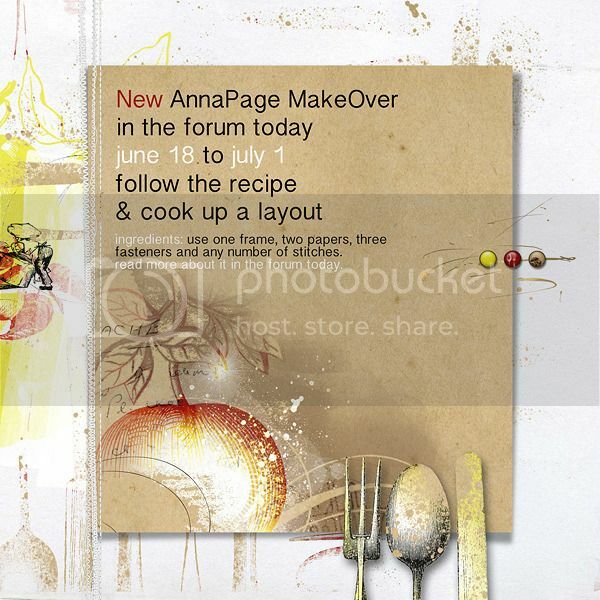 Join us in the gallery and share your AnnaPage MakeOver. Upload your Makeover by 5pm PST July 1 and check back here on Monday, July 2 to see who wins the Anna GiftKard. Last edited by casbury; 06-18-2012 at 10:59 AM. Totally FAB, Chris! Can't wait to get in my 'digital' kitchen and give this a try! Ooooh, I love these "Stash" type challenge - and that's one beautiful page, Chris. LOVE this!! I need to get my apron on asap!!! Here's mine - no before, but I have an after! Layout is linked. Here is mine for the makeover recipe!! oooo....my first time doing this. This is an original, not a do-over.